This elegant recipe takes pork chops to a new level of sophistication, with a rosemary-sage rub and a thick wine sauce to finish it off. Served with a glass of wine and side of Dijon potatoes, this dish is perfect or special occasions. In a large bowl, combine the garlic, sage, rosemary, salt and pepper. Rub the mixture firmly onto both sides of each of the pork chops. In a large, heavy skillet, melt the butter and the olive oil over medium heat. Add the chops and cook until browned on both sides, 6 to 8 minutes total. Add wine to skillet and bring to a boil. Cover, reduce to a simmer, and cook until chops are tender and juices run clear, 25 to 30 minutes. Remove chops from skillet and set aside. Bring juices in skillet to a boil over high heat and cook until liquid is reduced and syrupy, 2 to 3 minutes. Pour over chops and serve. Delish! I used sherry instead of white wine. I would use less salt next time. They were so tender! My finicky 5 yr. old loved them too. Will definitely make again. Yum! Just made it tonight, and we both loved it! The rub was fantastic- I might try it on grilled chicken at some point. 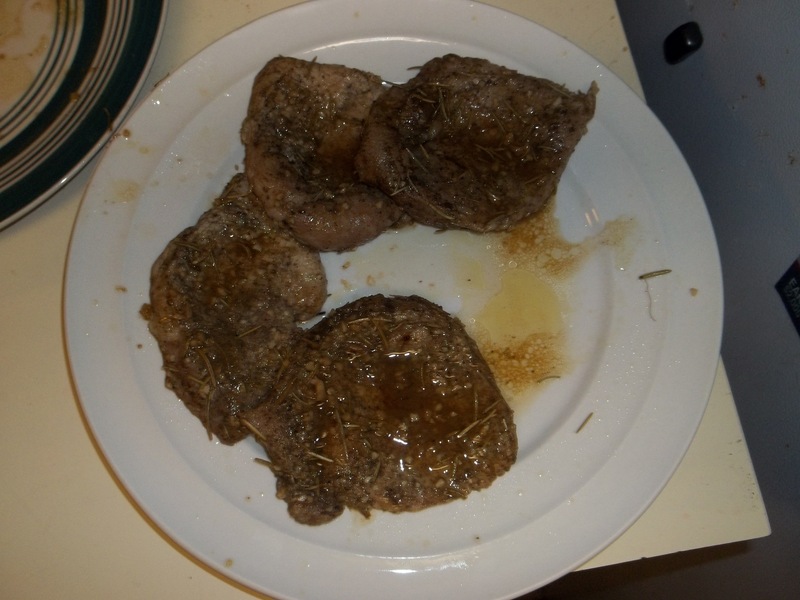 The store only had butterflied chops, so they were quite thin and dried out, but the wine sauce helped cover that up. I will definitely do this again, especially if I can find some nice thick chops! Also, it was very easy to do- I love the recipes where something simmers for a half hour. Very nice! Very delicious and easy to make. The pork was so juicy and flavorful! I served the pork chops with roasted Dijon potatoes and fire grilled asparagus. Definitely a keeper! My husband and I liked the flavors and the pork chops were very juicy. I used crushed garlic in a jar and it was a bit too moist so it should be drained or use fresh. 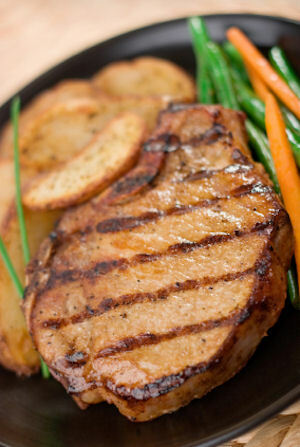 My family loves this recipe, and my husband was never a fan of pork chops. This recipe is great, however one thing I changed made all the difference. Since this is a darker meat, I added red wine. It really compliments the meat. Also I left it to marinate for an hour in red wine. Adds some color to the dish and a stronger taste. Easy and tasty! The sauce was savory. My husband loved it. 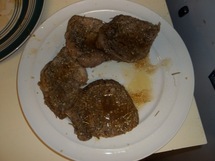 Made them with thick cut chops and they had to cook a little longer, probably an extra 15-20 minutes. Turned out great and I loved the sauce. This was great! Nice to have a change. Showing 10 of 29 total reviews and comments. Average rating of 4.79 stars based on 29 reviews. Summary: This elegant recipe takes pork chops to a new level of sophistication, with a rosemary-sage rub and a thick wine sauce to finish it off. Served with a glass of wine and side of Dijon potatoes, this dish is perfect or special occasions. Lamb chops and fruit make for a divinely simple and robust Valentine’s Day entrée. There’s something romantic about anchovies—and used in this sultry pasta recipe, the dish becomes simply devilish.